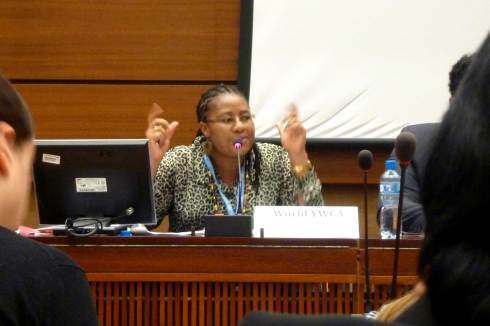 Today the Sexual Rights Initiative and the World YWCA co-hosted a side event on sexual and reproductive health rights and the post 2015 agenda. However, 3 of 4 countries with the highest rates of child marriage don’t show commitment to ending it as a practice. Ms Mokoena from the World YWCA did a great job of providing a grass-roots perspective on sexual and reproductive health, highlighting the gap between service provision and education as a major issue. She spoke about the importance of implementing both service provision and education at a community level, to ensure that women, young women and girls are well informed of the options available to them. There’s a lot of work to do! After the session we attended the premiere screening of Girl Rising, hosted by Plan International. The film spotlights the personal journeys of nine unforgettable girls born in unforgiving circumstances and their empowerment. The film aims to raise awareness that education and empowering girls can break the cycle of poverty in just one generation. You can read more about their work here.